GALION — Crestline beat Galion 61-48 Friday in the regular-season finale for the two teams. With the victory, Crestline finishes the season at 5-17 and Galion drops to 3-19. The Bulldogs would control the opening tip and get a quick lay-in by Zach Gregory on the offensive end. Galion would provide an answer, however, as Isaiah Alsip got the Tigers on the board with a three-point field goal. The game was physical from the start as both teams found themselves on the floor, diving for loose balls, committing hard fouls and having to work hard for every point. At the end of one, the Bulldogs led 11-9. The second quarter was much the same and Crestline went into the locker room with the 20-19 advantage. The Bulldogs outscored the Tigers 17-16 in the third quarter to lead 37-35 lead into the final quarter. A big dunk from Crestline sophomore Davon Triplett, on a dish from freshman Kaden Ronk, would ignite the Bulldogs and their fans. That dunk was just part of the 24-point fourth that gave the Bulldogs the win. Alsip finished with 17 points to lead the Tigers. Chase Cooke would chip in 15 points, five rebounds and three steals for Galion. Zhamir Anderson scored six. Colten Skaggs and Jack McElligott both added four points apiece, Skaggs grabbed nine boards. Gage Lackey scored two to wrap the Tigers’ scoring for the contest. Triplett and Kevin Winkler would both score 14 points for the Bulldogs in the victory. Triplett also had 10 rebounds Ty Clark ended the game with 12 points after being held to just a single point in the first half. Ronk had seven points for the game. Zach Gregory grabbed eight rebounds to go with six points while Tyler Sipes also finished with six while pulling down seven rebounds, dishing out nine assists and recording three steals. Max Anatra had two points to round out the ‘Dogs attack. Up next is the sectional tournament for both teams. No. 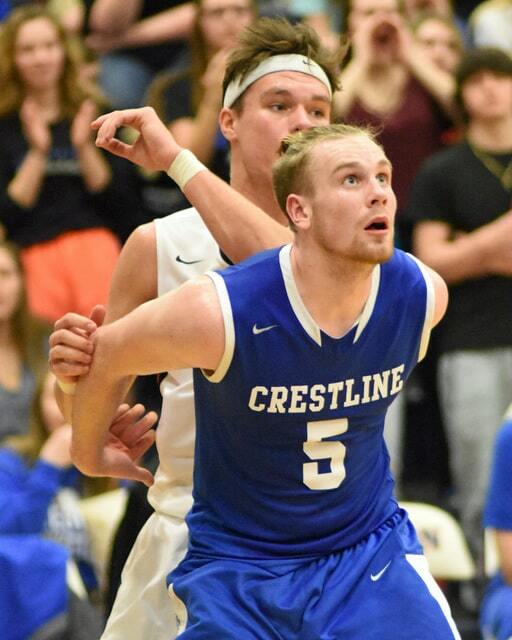 11 seeded Crestline will face-off against the No. 4 seeded South Central Trojans on Wednesday March 1 at 6:15 p.m. at Lexington High School. The Bulldogs lost to South Central on Jan. 3 68-47. Galion will head into their tourney run as the No. 9 seed in the Norwalk District. Their opponent will be the No. 6 seeded Clear Fork Colts. Tip-off for this game is Wednesday March 1 at 7 p.m. at Shelby High School. Galion sophomore Jack McElligott passes the ball out of the lane as the Crestline defense collapses on him Friday night at Galion High School. Photo by Don Tudor. http://aimmedianetwork.com/wp-content/uploads/sites/38/2017/02/web1_inquirer-022417j-Crestline-at-GHS_0027.jpgGalion sophomore Jack McElligott passes the ball out of the lane as the Crestline defense collapses on him Friday night at Galion High School. Photo by Don Tudor. Crestline junior Zach Gregory blocks out against Galion senior Chase Cooke on a free throw attempt Friday night at Galion High School. Photo by Don Tudor. http://aimmedianetwork.com/wp-content/uploads/sites/38/2017/02/web1_inquirer-022417j-Crestline-at-GHS_0121.jpgCrestline junior Zach Gregory blocks out against Galion senior Chase Cooke on a free throw attempt Friday night at Galion High School. Photo by Don Tudor.